Learn SEVEN ways to generate more revenue! more credibility, visibility and revenue streams. Including a 12 month blueprint to generate additional $100,000. What is the Power of Seven? The Power of Seven is our signature training program where you will learn, create and implement tools to quickly gain more visibility, credibility and revenue. It’s referred to it as CONTENT MARKETING. According to Wikipedia, content marketing is any marketing that involves the creation and sharing of media and publishing content in order to acquire and retain customers. Content marketing is also defined as a strategic marketing approach focused on creating and distributing valuable, relevant, and consistent content to attract and retain a clearly-defined audience — and, ultimately, to drive profitable customer action. The type of content businesses share is closely related to what they sell. However, the content’s main focus is on the needs of the prospect. This information is consistently delivered and can be presented in a variety of formats, including audio, video, white papers, e-books, email newsletters, podcasts, how-to guides, question and answer articles, photos, blogs etc. Our Founder/CEO, Desiree Doubrox, teaches you privately, in small or large groups, how to package, market and monetize your expertise in different mediums. Print, audio, video and live, on and off line. As well as how to utilize webinars, joint ventures, sponsors and speaking opportunities effectively. This will enable you to enjoy more freedom, generate more income and expand your message worldwide. 1. Networking, Speaking and Events Learn how to network at events that will increase your net worth and visibility. How to strategically set an intention, work the room, organize and achieve the fortune that’s in the follow up. Identify speaking opportunities where you can bring the network to you. Learn the six ways to generate revenue from hosting your own events; we call it cash in flash! 2. Joint Ventures, Sponsors and Affiliates You will multiply your audience, increase your profits, and leverage your efforts, database, expertise and resources. Even create multiple streams of passive income from your website, blogs and/or social media. Identify and build a sponsor package for businesses to fund your projects. 3. Tele-classes, Webinars and Google Hangouts You will learn how to utilize the phone and your computer to build a platform as an expert and create a worldwide audience, products and multiple streams of income. Create classes and programs from the comfort of your home or office. 4. Web Radio, Podcasts and You Tube channel Create the titles and formats for your radio show, podcast and TV show. Select the style that will generate your client’s enrollment. 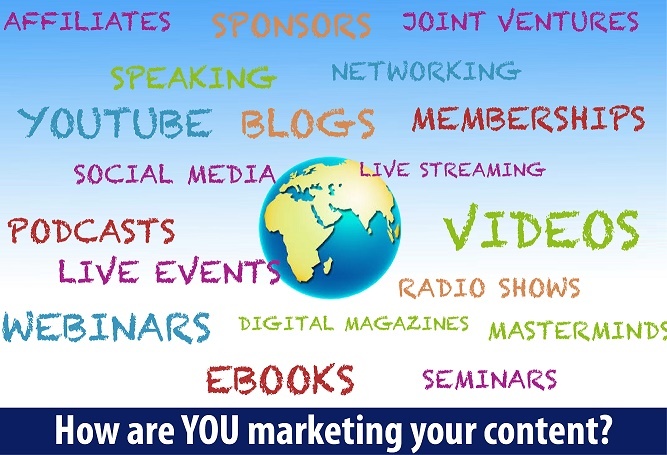 Learn how to monetize your content and increase your viewership worldwide. Optimize your SEO and attract affiliates, sponsors and thousands of fabulous fans. 5. Articles for blogs, newswires, e-magazines Determine and maximize your writing style. Publish articles and select the medium that will be easy to maintain and create a constant brand consistent with your message. Learn how to publish an ebook. 6. Programs, Products and Services You will create different types of low or no cost products, audio, video, written or manufactured. Select the highest and best use of these products. Determine which product is best used for lead generation or sale in your target market. 7. Build consistent content for your Social Media Learn why they say connectivity is the new currency and what, when, where and why you should invest in it. Learn how to establish connections as a point of purchase, offer services and how to monetize your time and efforts. Private Facebook group, to connect, promote and support each other. Interview with Founder, Desiree for our An Empowered Woman podcast, distributed throughout our community WORLDWIDE. An intimate, yet powerful way to introduce you to our world! YES...I want to schedule a complimentary Strategy Session with Desiree ASAP! YES, I’m Ready To Create More Visibility, Credibility and Revenue! Desiree will be sharing the tools she’s used to build million dollar businesses including An Empowered Woman and the soon to be launched HomWork. Someone who has taken classes and multiple courses OR someone who has been starting, fixing an building business since the age of twelve. They say “Experience is the Best Teacher”. Learn from someone who’s been there and DONE that. Believe me…It makes a difference. Count me in! Please notify me when ENROLLMENT OPENS. Dr. Cynthia Boccara “I’m now a media maven…she showed me how I’m going to systematically put into effect webinars, podcasts, etc. to make 100K. Roxanne Banks “You will walk away with the tools to move your business forward. Rita Boccuzzi & Jennifer Maldonado, “We now have a step by step plan to generate $500,000 this year!”. Sheila Maitlan, “The one thing I’ve been wanting to learn how to do for literally YEARS…I learned it this weekend. Dr. Patty Malone, “Videos, tele-classes and radio shows have all been on my radar, but now I know how to package that and monetize. Ann Bennett, “I was stuck in my business. Desiree moved me forward with the Power of Seven like a rocket ship into outer space! Jodi LaBossiere, “I have figured out how to make almost $20,000 a month in less than 20 hours. Still need more information? Watch the webinar below.